Home→Just For Fun→The Great Paperback GHOST Giveaway! The Great Paperback GHOST Giveaway! 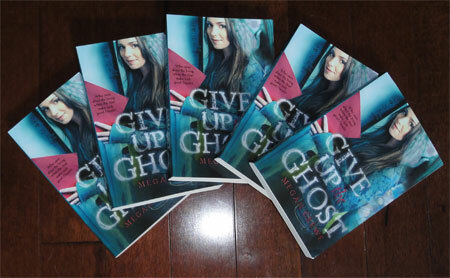 My author copies of the Give Up the Ghost paperback edition! The paperback officially comes out next Tuesday (April 12th), but it may pop up in stores before then, so keep your eye out. This version contains some very special bonus materials, including an interview with me and two deleted scenes featuring a couple of ghosts who didn’t make it into the final cut of the book, Rachel and Leah. To celebrate the paperback’s release month, a few different bloggers will be hosting giveaways later this month. I’ll share those links when the giveaways are up. But of course, I want to be in on the fun too. So the very first giveaway starts here! A paperback copy of Give Up the Ghost signed and (if you’d like) personalized by me, plus some extra ghostly swag. There are four copies up for grabs. Two are just for North American readers, and two are specifically for readers outside North America! All you need to do is comment on this post, including a contact e-mail and your country (so I know whether you qualify for the N. American copies or the international copies)! -Mention and link to the giveaway on your blog/website/Facebook page/etc. (one entry for each place). -Tweet about the giveaway on Twitter or retweet one of my tweets about it (can do this as often as once a day, extra entry for each time). -Post the Give Up the Ghost book trailer (found here) on your blog/Facebook page/Twitter/etc. (one entry for each place). -Put the animated banner for the paperback (found here) on your website/blog/etc., linked to my website (one entry for each place). -Add Give Up the Ghost to your GoodReads to-read list, if you haven’t already. -Post a review of Give Up the Ghost (if you’ve already read it) on Amazon, GoodReads, BarnesandNoble.com, or the Chapters/Indigo website (one entry for each place the review is posted). Entries for the international copies are open to every country in the world. Entries will be accepted until April 25th. The winners will be chosen by random draw by April 30th. Yay! Congrats on your PB release! Congrats on the paperback release!! Congrats on the paperback release – sounds like a great book! I’d looove win this book!!! Congratulations! If anything, I’m happy that your book did well enough in hardback that it made it into paperback. Good for you! Oh…i almost forgot.If you want to translate you what I wrote in the post ,please contact me on the e-mail address.And I’m from Romania. Hi, Megan! I’m Roxanne and i found this contest on the Bianca’s blog. And I’m from Romania to. Hi! Congratulations on your paperback release! Hi,Megan! Great contest! Thank you! I posted about the contest and about the book on my blog. I also posted there the interview with you,so I hope you’ll check it out here:http://morethanordinarybooks.wordpress.com/2011/04/15/interviu-cu-megan-crewe/ Thanks you so much for this contest-again. And I am from Romania. Congrats on the paperback release 🙂 I’ve been wanting to read this book for awhile now, heres to hoping I win! Hi Megan! I really appreciate you, you did a great job with this book and you’re a fantastic writer! Looking forward to the Skype visit at Fort Madison High School! Looking forward to the Skype visit at Fort Madison High School in the U.S.A.
Hopefully I can get a copy! I read the book too! Dying for the story between Rachel and Leah and I love swags. This is an awesome giveaway! I just posted the video :D! Hey, that’s so cool.I’d love to win. Hi! My email is : andreiutza4ever04@yahoo.com and i’m from Romania. I love your books and also i love this contest.